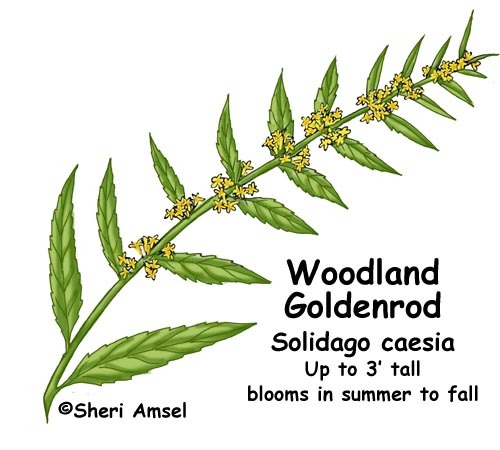 They are found in found in open woodlands and along the edges of woodlands. Their leaves are long, thin, lances with toothed edges. 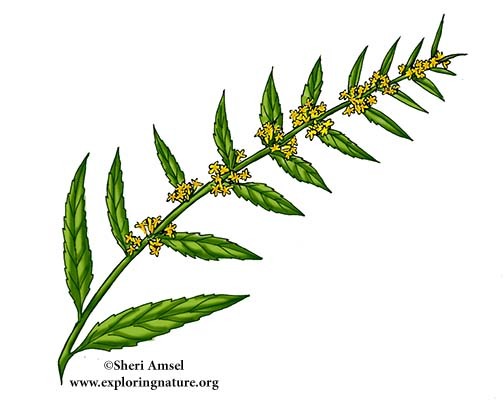 They have yellow flowers grow in clusters at the leave stems (axils). They bloom in summer to fall, the plant arching over. Please Login or Subscribe to access downloadable content. When you research information you must cite the reference. Citing for websites is different from citing from books, magazines and periodicals. The style of citing shown here is from the MLA Style Citations (Modern Language Association). When citing a WEBSITE the general format is as follows. Author Last Name, First Name(s). "Title: Subtitle of Part of Web Page, if appropriate." Title: Subtitle: Section of Page if appropriate. Sponsoring/Publishing Agency, If Given. Additional significant descriptive information. Date of Electronic Publication or other Date, such as Last Updated. Day Month Year of access < URL >. To view these resources with no ads, please Login or Subscribe (and help support our site). Exploringnature.org has more than 2,000 illustrated animals. Read about them, color them, label them, learn to draw them. ©2005-2019 Sheri Amsel. All rights reserved. The material on this site may not be reproduced, distributed, transmitted, cached or otherwise used for anything other than free educational use. It is not to be used for sale or profit of any kind. If you are unsure whether your use of site materials violates the exploringnature.org copyright, contact Sheri Amsel for prior written permission at sheri@exploringnature.org. Thank you for respecting copyright laws.